“Our analysis suggests that this is the same population living in this part of the world over time, so we have genetic continuity from 10,000 years ago to the present,” said University of Illinois anthropology professor Ripan Malhi, who led the study with University of Chicago postdoctoral researcher John Lindo; Penn State University biology professor Michael DeGiorgio; Rosita Worl, the director of the Sealaska Heritage Institute in Juneau, Alaska; and University of Oklahoma anthropology professor Brian Kemp. 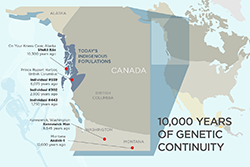 The paper “Ancient individuals from the North American northwest coast reveal 10,000 years of regional genetic continuity” is available upon request through kathy.dye@sealaska.com. Sealaska Heritage is a private nonprofit founded in 1980 to promote cultural diversity and cross-cultural understanding through public services and events. SHI also conducts social scientific and public policy research and advocacy that promotes Alaska Native arts, cultures, history and education statewide. The institute is governed by a Board of Trustees and guided by a Council of Traditional Scholars and a Native Artists Committee. Its mission is to perpetuate and enhance Tlingit, Haida, and Tsimshian cultures of Southeast Alaska. CONTACT: Rosita Worl, SHI President, 463-4844, rosita.worl@sealaska.com; Michael DeGiorgio, 814-867-5366, mxd60@psu.edu; Brian Kemp, 530-848-4328, bmkemp@ou.edu; John Lindo, jlindo@uchicago.edu; Ripan Malhi, 217-419-2015, malhi@illinois.edu.